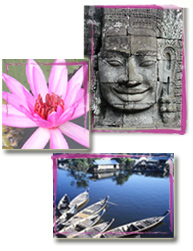 Buffalo Trails is a friendly, responsible, family-oriented tour operator focusing on Cambodia history, culture, traditional life style and respect for the environment. Founded in 2009 by a Cambodian professional team who passionate about the Cambodian history, the beauty of the countryside, traditional way of life, and skills and knowledge of local families. Building on professional experience working in tourism, ecotourism- community based ecotourism, environmental education, and livelihood development, the Buffalo Trails team proposes discovery excursions around Siem Reap, including temples, Tonle Sap Lake and countryside, in a socially responsible manner sustainable for the environment and providing benefits to family partners (villagers). Buffalo Trails is willing to share the unique sense of welcome of the villagers surrounding Siem Reap province. Our tour guides ensure an up close and personal experience with the community, allowing you to see authentic Cambodia while making a positive contribution.